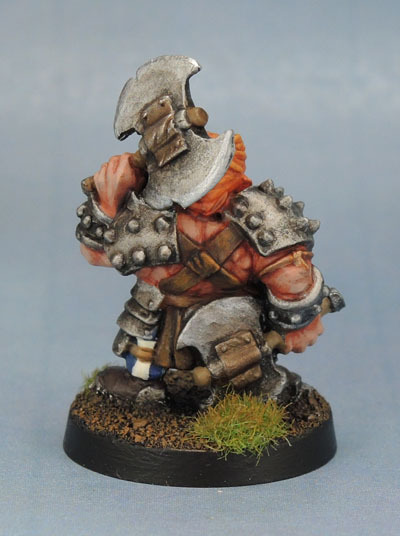 Dwarf Berserker | Azazel's Bitz Box. 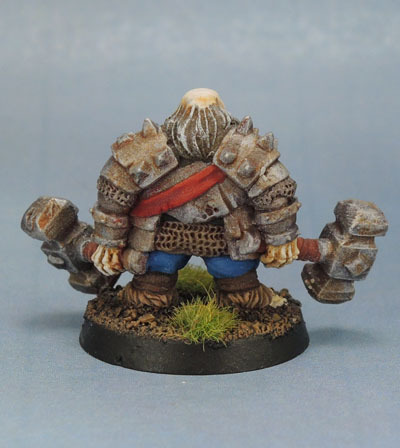 Some time ago now, I backed the Stonehaven Miniatures Dwarf Kickstarter. The Kickstarter managed to pretty much deliver on time and provided a rather nice assortment of Dwarven RPG tropes for a very reasonable price. 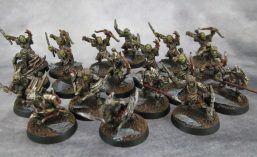 They have run several other campaigns, both before and after but none resonated with me in the way that the Dwarves did, so it’s been the only one I’ve backed, since a bunch of random gnomes, halflings, half-orcs or even elves don’t resonate with me in the way that Dwarves do. They’ve got a nice little line of trolls as well, but at US$20 a pop plus international postage, they’re out of my impulse shopping range. Still, they have a nice range if you’re looking for an RPG-themed model from any of the ranges they offer. Anyway, this post isn’t here to be an advert. It’s to show some models~! 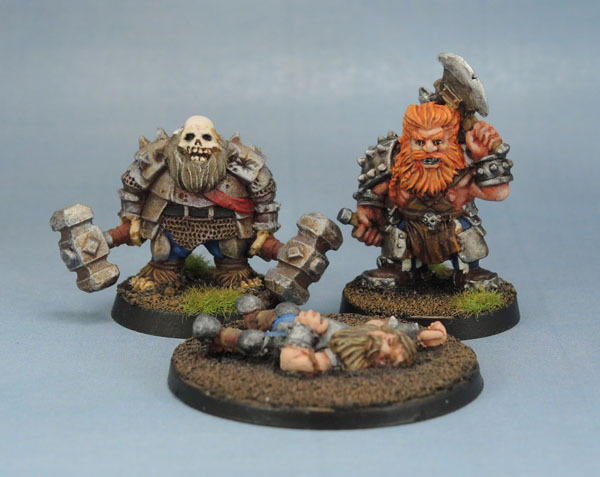 Stonehaven Undead Dwarf, Berserker Dwarf and Unconscious Dwarf. The three that I’ve painted so far. I found another trio part-painted in a figure case the other day, so I might get some more done before the end of the year! The Stonehaven models have something about them that’s a throwback to the late ’80’s-early ’90’s. In some ways it adds to their charm and in others it makes aspects of the models quite meh. Many of them are quite “flat” in the same way that many one-piece models of that era were, and while the details are great in some spots, they’re a bit flat and plain in others – particularly on faces, and especially on the females (and that skull above!) They’re nice models, but their sculptors are no Perrys, Prows or Adams. 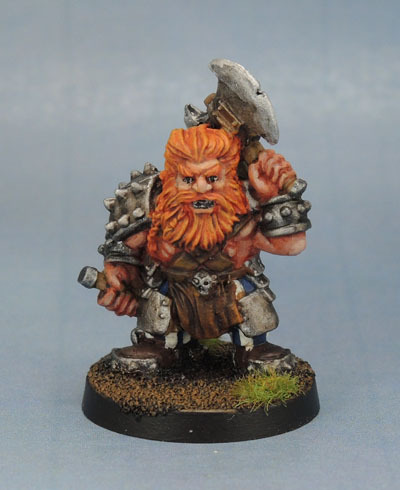 Stonehaven Dwarf Berserker – with a Slayer-themed hair colour. This guy was started quite some time ago – probably not long after I received my KS models. For some reason he lagged out, and was finally picked up and completed a few days ago alongside Aenur from the previous update. I went for a Dwarf Slayer look, as I figure that a bit of spiky armour doesn’t preclude the seeking of an honourable death in combat. I tried to add some tonal qualities to his weapons and armour to make them look well used without going down the road of rust and decrepitude. He’ll be incorporated in with the other slayer models I’ve shown and worked on, and will likely have an additional role in my eventual larger dwarf projects. Did the sash and twin hammers denote authority before this dwarf met his fate? 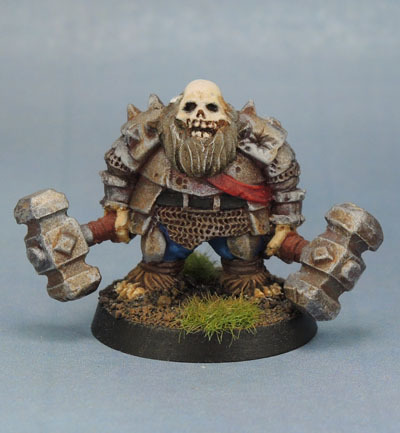 Speaking of decrepitude, here’s the Undead Dwarf. The main feature of this model is his arms and armour, to which I’ve tried to make look both uncared-for but still in use. Hence not going to town with the rust effects. The skull sculpt is lacking a little in terms of definition, and I didn’t want to (couldn’t be bothered to) paint in depth in the maxilla, so I painted it “as is”. I do like having some non-human undead, so he’ll probably find a home in the Undead army in some form eventually, as he was started long before I began to raise the undead hordes. Dead? Knocked out? Drunk? Or just sleeping? 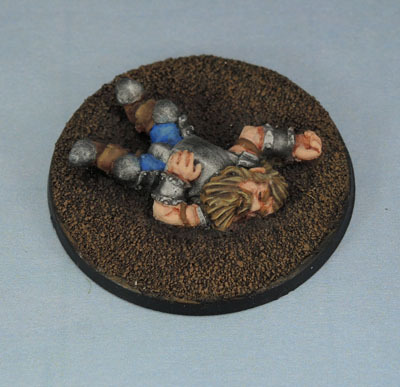 That series of questions explains why this unconscious dwarf is painted and simply laid on a round, plain brown base devoid of all “context markers” like blood, grass, weapons, shield or a helm, or even a beer stein. I wanted to keep this fellow as non-specific as possible so that the model can be as flexible as possible. he could lay slain on a battlefield or lying unconscious on the dirt(y) floor of a cell or a dungeon. He could be passed out in the horse stables after way too much boozing. 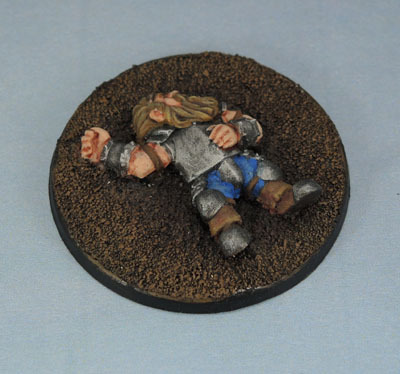 Whether he’s being used to mark the long sleep or just a nap between goblin-slaying, this guy is done!